On February 19, 2015, members and guests welcomed Attorney David Patzer to review the most important issues relayed at the 2015 Heckerling Institute on Estate Planning. Members can access his outline once signed in. 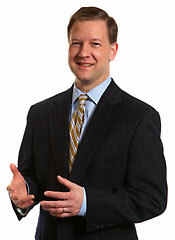 David Patzer is the chair of Godfrey & Kahn's Estate Planning Practice Group in the Milwaukee office. His areas of practice include fiduciary income taxation, estate and gift taxation, probate administration, and the preparation of marital agreements, wills, trusts and other estate planning instruments.